This classic, wood frame is 1 1/4" wide with an overall size of 13 1/4" x 16 1/4".Archival mounting, acid free backing, double matting and clear glass are used in framing this certificate. The price includes heavy duty packaging and USPS priority, insured mailing in the continental US. Mailing to Alaska, Hawaii and international destinations is available at actual cost. 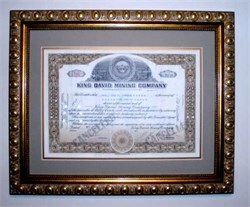 Beautiful certificate from the King David Mining Company issued in 1937. This historic document was printed by Republic Banknote Company and has an ornate border around it with a vignette of King David's Crown. This item has the signatures of the Company's President and Secretary and is over 71 years old. The King David Mining Company controlled a group of mining claims on Grampian Hill west of the Horn Silver Mine, organized in the summer of 1908.